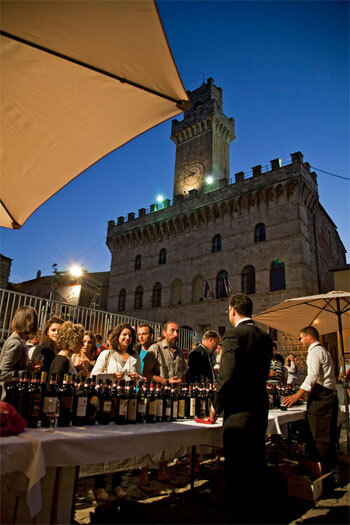 Chalices of Stars is the most important event of itinerant tasting open to all, organized by Strada del Vino Nobile di Montepulciano e dei Sapori della Valdichiana Senese. 10th august, Chalices of Stars returns as it does every year, to celebrate the night of St. Lawrence with its protagonist : Vino Nobile di Montepulciano DOCG and Rosso di Montepulciano DOC. For the occasion the Districts of the Bravio delle Botti will open their seats for visitors to taste authentic local and traditional gastronomic products accompanied by wines of Montepulciano. Along the city streets there will be a Market of Art and Antiques, live concerts under the stars and exhibitions by the group of Flag Throwers and Drummers of Montepulciano, in Piazza Grande.